This Villa offers a unique view of Tuscany and Chianti District the surrounding valley typical of the Chianti hills (olives and grapes) and is located a short distance (3 km) from the town of San Gimignano famous for its medieval towers. The villa with its own private pool has been completely restored from an old barn and originals materials have been used for its restruction as terracotta floors and exposed wood beams on the ceilings. 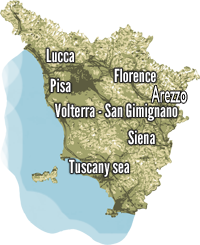 Villa being in the centre of Tuscany is a great place to spend a quiet holiday without sacrificing the various excursions and it is within easy driving distance from major cities as Siena 35km, Firenze 50km, Pisa 65km, Volterra 25km, Lucca 70 km.